The 704 is a nice little EDC pocket knife which was out of production for about a year and a half. I originally bought one from manafont.com and gave it to my dad, thinking I could just get another one. But when I went to order a replacement, I found out the 704 had been discontinued. So, I was happy to find out that exduct.com was selling them, which is where I bought my review sample. Not only are they making this model again, the new versions do not have the SRM logo printed on the handle, which makes the knife look even better. This sample was purchased from exduct.com and took about a month to arrive. I notice that it’s now available on Amazon. The blade is a hollow ground with a spear point tip, with a swedge that runs about half the length of the blade. It has a thumb stud screwed into it with a Torx screw, but does not appear to be reversible, though you could probably take it off. The blade is also reasonably thick. There’s not as much belly on the blade as the 763, which makes the knife overall slimmer. The SRM logo is laser etched onto the blade (next to the thumb stud) with the 704 number to the right of it. 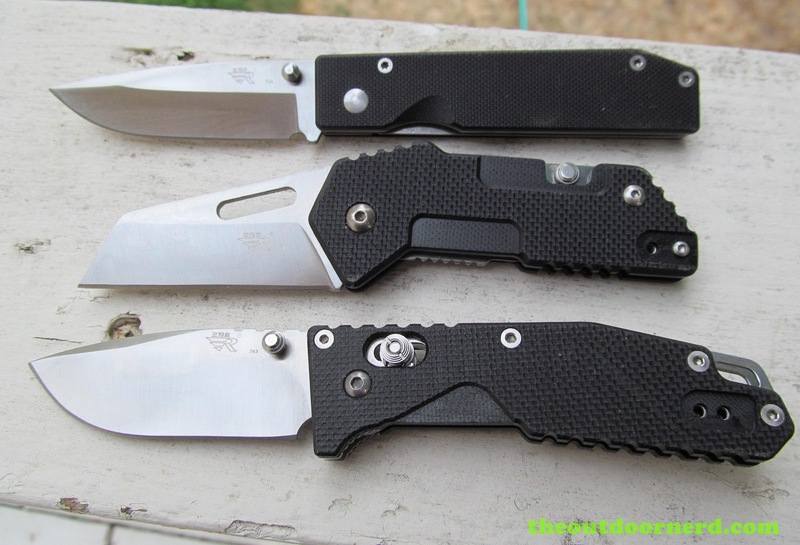 The handle is made of textured G10 material, which is not quite as aggressively textured as its siblings such as the 763 or the T11, shown below. I prefer the more aggressive texturing, but find the texturing on the 704 to be plenty acceptable. The G10 material sandwiches solid steel liners, presumably made from the same steel as the blade. The pins also appear to be steel and have Torx bit screws holding them together, which means the knife can be disassembled. The clip is also steel and comes mounted for right-handed, tip-down, deep-pocket carry. If you’re a lefty, well, you’re screwed. The clip can however be switched to tip-up carry. It’s held on by two Torx bit screws and is a little stiffer than I would like, though I’m sure it will loosen over time. I’m not that big into clips anyway. This is a right handed knife, as neither the clip or thumb stud can be changed for left-handed carry. The 704 is a liner lock knife with a steel skeleton. The liner is a little on the thin side, but I don’t think that anyone will ever mistake this for a heavy duty knife. A thicker liner would make the knife bulkier, so I think they struck the right balance for an EDC knife. The lock has no jimping on it like some of the newer models. In fact, the knife has no jimping whatsoever. This is a fairly typical, though maybe a little outdated design. There’s not much to say about the design. It’s just a basic, compact and lightweight folder at a great price. It’s a simple, functional, well-executed design, and I’m glad that these are back in production. On my review sample the fit and finish is good overall. Mine came with the pivot screw over tightened, and I had to loosen it before the blade could be deployed one-handed. The blade is also a little bit off-center, which does not seem to affect the knife, i.e. I can discern no wear or scratch marks from it. The lockup on mine is solid, and overall the knife has a great feel for one so compact. Over time the action has gotten a little smoother. My sample came with a razor sharp edge on it. There are numerous but barely noticeable tool and machining marks, which I have to look very closely to see. These are cosmetic only. The G10 handle material and handle screws are perfect from what I can tell. This is a very usable knife for EDC. Between the two I’ve owned, I have carried this model a total of a couple months. It has a nice slender feel, and I can reliably open it one-handed most of the time. Because it’s a liner lock, it’s a little heavy for its size compared to something like my Spyderco Dragonfly, which is 1.0 ounce versus the 2.4 ounces of this knife. But some people prefer a more stout knife. The blade grind and geometry are well-suited to EDC tasks such as opening mail, light food prep, basic cutting, etc. This is a great little pocket knife. While the design is a little dated compared to some of their newer models, it still holds its own because of its compact shape and no-nonsense style. I would consider this a “gentleman’s folder” – one I would happily (and did) give my dad. At about 10 bucks, it is also an amazing value which is on par with knives that cost several times more. I have purchased a bunch of SRM knives through exduct.com (the only official distributor?) and I look forward to more. SRM just seems like one of those budget companies that doesn’t try to cut any corners on quality. As far as I can tell, for the price you don’t sacrifice much, if anything. I think I’m going to start putting up short videos demonstrating how these various knives open and close one-handed.